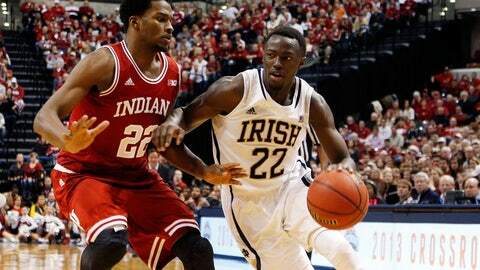 Notre Dame guard Jerian Grant had a great game against Indiana last week to help get the Irish -- and the ACC -- a big win. Notre Dame: The Irish generated a lot of raised eyebrows and disapproving head shakes with that loss to an experienced, tough North Dakota State team at home. But then they bounced back and beat Indiana in Indianapolis. It was a neutral site game, but Indiana fans were by far the majority. Indiana isn’t what it was last year, but it still has some young talent. That’s a nice win for the Irish, and it showed what they’re capable of when they can get it together, especially offensively. Honorable mentions: Maryland’s Evan Smotrycz played 52 minutes in two games last week and took 20 shots, making just four of them. He also had seven fouls. And he was 1-of-12 shooting against Florida Atlantic. … N.C. State’s Desmond Lee did finish with nine points against Detroit, but he also had two fouls and five turnovers in 26 minutes. â¦ BC’s Eddie Odio saw a total of 39 minutes in two games, and attempted just two shots somehow (making one). But his stat line against Maryland was amazing: 14 minutes, no shot attempts, 0-of-1 at the foul line, one rebound and four fouls.